Thanks to Silja Chouquet (@whydotpharma) and Andrew Spong (@andrewspong), â€œtwittersâ€ on the internet interested in social media in health care and pharma, had a first Tweet up on this issue at the twitter site #hcsmeu, friday august 7th . What are the most important differences between the use of social media EU vs. US? What is the key driver of the adoption of hcsm (health care social media) Â in your country? Patient advocacy, health care professionals (hcp) bloggers, or national health systems? So no lack of interests, as can also be seen at #hcsm. Concerning the difference of the social media situation over EU countries. These do not seem to be large. Rather, there is a resemblance in all EU countries in social media just beginning to evolve. In no country according to the participants, thereâ€™s a fierce development or exploitation of social media. There are nice examples and serious attempts, but they seem to be in a state of â€œtrying toâ€. Some statements specifically: In Spain for instance, recent research shows interest by pharmaceutical companies to use media as a way to relate to stakeholders, but are reluctant due to local regulation. In the top 100 sites in Spain, visited by Spaniards looking for health information, none stems from a Pharma company. SuchÂ is said to apply for Germany too. One discerns a positive development, also from health care insurers, but the mindset is still â€˜system madeâ€™. Traffic from German healthcare seeker on the internet land for the most part on health care start ups with social media applications or health care portals with communities and forums. Such could be said to be the case as well in the Netherlands. Some sites open up to patients/consumers and these are mostly run by specific patient associations. For Germany and the Netherlands applies that social media and Rx do not go together. As for the UK, it was mentioned that there is a local NHS on Twitter. Furthermore, that one is putting together in the UK a working party to discuss digital media and the use of social media in pharma. Overall, it is noted that information in social media is more shouting at people than interacting with them. Isnâ€™t that typical for the evolving phase SM is in? But there is an interesting example in France of sponsoring the breast cancer community by @roche. Such sponsoring examples might be found in the Netherlands too, although pharma companies are expected to publish their sponsorship relations to patient associations, as is the case elsewhere in the EU too, as I presume. On the differences between the US and EU on the use of social media, it was generally acknowledged that the allowance of DTC in the US and the prohibition of direct consumer adds in the EU concerning prescriptions, is the most striking one. But the question remained whether that is the main reason for the slow development of the use of SM in the EU. Wouldnâ€™t the use of different languages have an impact â€“ Imagine French, Spanish, Italian, German, English, etc..? Others thought that the attitude of EU Pharma companies differs from across the ocean in the US: these are perceived to be more aggressive than in the EU and more apt for going on until one gets what one wants.. But then again, regulatory arrangements, promotion and communication rules for pharma differ over EU countries and national authorities are keen to maintain them. Â Well for that matter, associations were made as to â€œUSâ€ and â€œEUâ€ attitudes as for â€œdoersâ€ and â€œthinkersâ€, or as for aggressive or academic â€“ I think that is one issue to further explore as for its meaning â€“ if it be no biased remark. Anyway, attitude in the sense of â€œiron-willedâ€ advocacy for social media is seen as a prerequisite to pursue the innovation and to champion social media as an authentic means of improving pharmaâ€™s image. ugh there are different and lots of regulatory arrangements in the different EU countries, one sees a lot of value in social media for compliance, disease awareness, patient and consumer campaigns and much more in care. There is opportunity to use social media in consumer focused educational campaigns, and brands are doing this at the moment in EU. Another issue of importance to influence the emergence of social media in the EU, undoubtedly, is said to be the differences in reimbursement schemes, which boils down to the question: when social media are to be in the realm of free services: who is going to pay. When prices for pharmaceuticals are under harsh pressure, where are the extras to be found to generate budgets in pharma for social media development. Yes, sales forces are shrinking, but that is not with the intention to pay for social media, is it? One specific remark to that was given: pharmaâ€™s attitude would be still too relational to be transactional, as is needed in social media. Concerning the question for the key drivers to the adoption and use of social media, a lot of the same issues as mentioned before were forwarded here too. Attitude is relevant, and again context of rules, regulations, reimbursement, and specifically the separation of community segregation between health care, patients/consumer communities and health care, Rx professionals. In this sense, pharma programs for compliance online are said to be questioned by the European Commission! Actually I, myself do not see those communities integrate, due to the difference in perspectives, but once care itself is at stake, and not just Rx, there could be a chance to relate health care professionals through social media to patients. There must be some good examples already! And indeed, patient associations are forwarded as the drivers to social media development. They will have transparency, relevance, reciprocity, authenticity, commitment â€˜baked inâ€™ their strives, as relevant issues for success in this. Interesting enough, aspects of pharma companiesâ€™ organisations came forward as probable inhibitors to their development in using social media: the issue of change, and management of change. Also, the attitude as how to adapt to given contexts or as to be challenged by opportunities. Adhesion of top management plays a role, one remarks, but also the issue of linking social media to EU strategies of pharma, not just to affiliatesâ€™ tactics locally. In my personal conclusion: we are just beginning to discuss and use the potential of possibilities and opportunities generated by social media in the EU. But one striking issue seems relevant to mention here. I would make a serious distinction between the use of social media in the pursue of care for health, and the use of these channels for pharma promotionâ€¦The latter seems just one bridge too far to pharma in the EU. But still, when pharma is able to collaborate with other parties to the use of social media in health care, new images of pharma and positions in health care communities lay ahead. Probably things pharma could need. But indeed, thatâ€™s quite a change! Rob, congratulations for the excellent review. Just a correction: Actually time for Friday tweetup is 13:00 CET or GMT +2. Kind regards. Miguel. Thank you Rob for this excellent review â€“ you must have invested some time to sift through all the tweets! I agree with your conclusion on the objectives. I do not believe social media can be a direct promotional channel for pharma â€“ nor should it become that (even in the US, where this is allowed). Social media is about a two-way conversation and therefore should focus on achieving awareness of diseases. access to treatment and care and improved adherence â€“ all very powerful and valuable objectives that could be served with social media. Thanks again for participating and promoting the discussion. 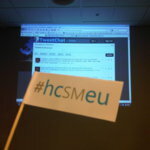 Please allow me to second Silja thanks for your having undertaken this analysis of the inaugural #hcsmeu event. If the discussion and your commentary continue to proliferate in this way, youâ€™ll have a book written by the end of October. I suspect youâ€™ll find no argument anywhere within the #hcsmeu or #hcsm communities regarding your assessment of the appropriate use of Twitter interaction in the health care environment. Sharing, good. Selling, bad. Twitter, as it has often been remarked in various contexts, is a relational, not a transactional environment. We interact. We discuss. We learn. We build relationships. Whatever may emerge from those behaviours is incidental, not fundamental. â€˜Seeâ€™ you tomorrow (14th) at 1pm CET on #hcsmeu.